Do you have a cavity that is a constant nuisance? How about a chipped or cracked tooth that is the source of dull but persistent pain? If so, a dental crown can easily make these problems a thing of the past. Crowns are custom-made restorations we can use to repair and enhance damaged teeth, and thanks to our team’s skill and artistic eye, you can trust that the end result will be as beautiful as it is natural-looking. If you’re in need of some top-quality smile repair, give New Haven Dental Group a call today. 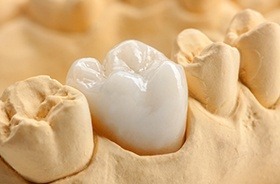 A dental crown gets its name from the fact that it literally sits on top of a natural tooth. This enables it to do two important things at the same time. One, it protects any weakened or fragile enamel, and two, it’s able to restore a tooth’s original shape and appearance. Crowns help us save damaged teeth rather than remove them, which is a much more conservative approach that is also better for a patient’s long-term oral health. 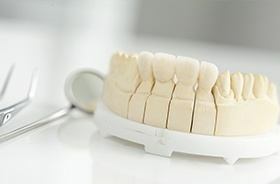 Crowns can be made from a variety of materials ranging from all-metal to all-porcelain. The material we choose will be based on where a tooth is located in the mouth as well as a patient’s specific situation. Generally, a back tooth needs to be as strong as possible, so we’ll use a metal crown, while a front tooth needs to be strong and pleasing to look at, in which case we’ll provide an all-porcelain crown. First, your dentist will examine your tooth and recommend a crown as a treatment option. If you agree, they will proceed to the next 2 steps. 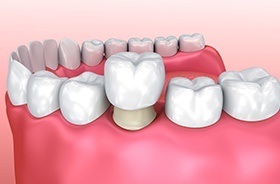 Your tooth will need to be slightly reshaped in order to securely hold the crown, so after numbing you, your dentist will gently remove any damaged or decayed enamel. 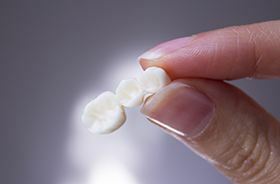 Once this is complete, they’ll take an impression of your tooth and send it to a dental lab to make your crown. Before you leave this appointment, they’ll cover the tooth with a temporary restoration. About a week or so later, you’ll return to New Haven Dental Group to have your temporary removed and your final crown cemented into place. After checking the fit and your bite one last time, that’s it-- your new tooth is ready! Right after the procedure, your tooth might feel a little more sensitive for a few days, but this should subside naturally. To take care of your crown, all you need to do is treat it like a natural tooth, meaning you should brush, floss, and attend regular checkups. With this approach, you can look forward to your crown lasting for about 15-20 years.